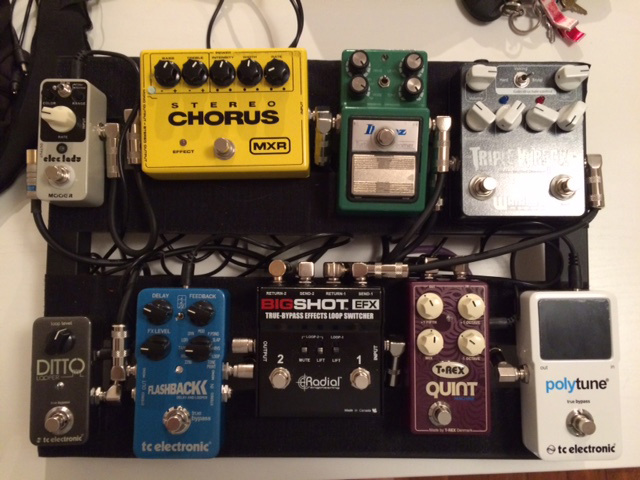 Today’s pedal line is from Alastair Pryor. If you have a pedal line (doesn’t have to be in a board) for your rig, please email me a photo, bio, description of pedals and routing to pedalline@nulleffectsbay.com. Every Friday I’ll showcase a pedal line submission. Make sure you include any links to your band or music page. This is my current iteration of my pedal board. Right now I’m just a home enthusiast but would like to get back into a band setup at some point. Been playing guitar for 20 years although like most non-professional players I’m not on it every day – life gets in the way of Rock n Roll in the real world :(. Route – Cry Baby Wah (not in picture) > TC Electronics Polytune 2 > T-Rex Quint Machine > Radial Bigshot EFX > (Loop 1) Wampler Triple Wreck > Keeley Mod Ibanez Tube Screamer TS9-DX > Radial > (Loop 2) MXR Stereo Chorus > Mooer Elec Lady > Radial > TC Electronics Flashback > TC Electronics Ditto > Sometimes this Plexi “Little Bear” distortion pedal (not pictured) which I had to put together when it arrived in post. Reliable Wah – plenty of people have them and it sounds pretty good! This sounds crazy but in terms of rating a pedal on what it does this is probably the best pedal I own. If you want a tuner then I’d highly recommend this one. Ultra bright display and very accurate and easy to use tuning. Total silence when you turn it on. Love it. Only just acquired this as a Xmas gift to myself. Impressed with the cosmetic aspect, easy to use. Bit of hiss when on but that could be my setup. I use this so I can switch between my distorted tone and my clean tone which probably has a little bit of chorus or flange. Just hit both switches at same time. Passive pedal so doesn’t require power and is reasonably small for its footprint. Basic and cheap alternative to more powerful switching systems out there. Pretty versatile distortion and can also be used with the boost switch for a fuzz style tone. Definitely good for dialling in a Metallica style of tone or Tool 10,000 days style sounds. Plenty of options for tone depending on your tastes. Completely quiet when you’re not playing as well which is important with your drive pedals. I use this to get an AC/DC style tone. You always see TubeScreamers mentioned in all time overdrive pedal lists so I purchased it to see what the fuss was about. Does the job for me. Purchased it off a mate who wasn’t using it. Adds a bit of colour to the tone and has a treble boost option which seems to be malfunctioning on me currently! However for my standard chorus sound it sounds pretty good. Experimented with a few Mooer micro pedals and wasn’t hugely impressed with the others however this Elec Lady has one particular dialled in setting which sounds really good. For the price this pedal is quite a bargin although not all settings are completely usable. I use it playing along to parts like the flange sound in Rage Against the Machine “Wake Up”. It’s also really small so leaves room for more pedals! Easy to use delay with all the bells and whistles, really good delay pedal. I got this out of frustration trying to use a Boss RC-2. This Ditto pedal is so easy to use, it only has the switch and the one dial. There’s a handful of combinations to record, turn off and on, remove previous loop etc. I would highly recommend this looper to anyone and it’s pretty cheap and once again it’s small so if you’re using a relatively small pedal board like this Pedaltrain JR that I have it’s ideal. Purchased for $50 on ebay purely for novelty factor, had to put it together when it arrived and I was expecting nothing. Was pleasantly surprised when I fired it up. Quite a lot of gain and managed to get a nice Smashing Pumpkins Siamese Dream fuzz from it. If you got a spare $50 you want to get something different go for it. I’m playing through a Blackstar HT40 using an Epiphone Les Paul Prophesy or an Ibanez SZ series both with EMG active pickups. With this equipment I can easily dial in Tones from Metallica – Pantera through to lighter driven tones for Pearl Jam, AC/DC etc. Hoping to upgrade to a Gibson Les Paul 2014 standard when I can justify it!